In the recent years, the popularity of visual novels has taken off in the west. As this happens, more and more publishers seem to be announcing the western release of many different sub-genres, while others turn to crowdfunding platforms in order to localize certain titles for more of a “niche” audience. There’s much debate between gamers about the definition of “Video Game,” but one thing is for certain: visual novel lovers put their money where their mouth is and have made the genre an important market for Japanese publishers and developers in the west. One of those publishers is no other than Japanese developer Spike Chunsoft, best known in the community for the Danganronpa and Zero Escape series. The company has recently taken it upon themselves to self-publish games in the west, mostly to PC. Self-publishing is something that many Japanese developers are turned away from based on the complexity and business practices needed to properly release a title. However, Steam has been making it easier and easier for Japanese developers to at least have the option of publishing their titles to the digital store for the PC market. Steam has been making it easier and easier for Japanese developers to at least have the option of publishing their titles to the digital store for the PC market. During GDC 2017, Spike Chunsoft announced they will publish 428: Shibuya Scramble to PS4 and PC through Steam. Lacking the name of some of the developer’s more notable series, the game might have went under some visual novel fan’s radar: let it be known though that fans of the genre would be doing themselves a disservice by not taking a moment of their time to learn about this game. After sitting down with Spike Chunsoft’s David Kracker at E3 2017, we learned everything we could about the game’s premise and localization process as well as the developer’s plan for bringing other visual novels to the west. 428: Shibuya Scramble can not be compared to many visual novels released in the west. When someones says “visual novel,” many will automatically think of anime style visuals, but that is not the case with 428: Shibuya Scramble. 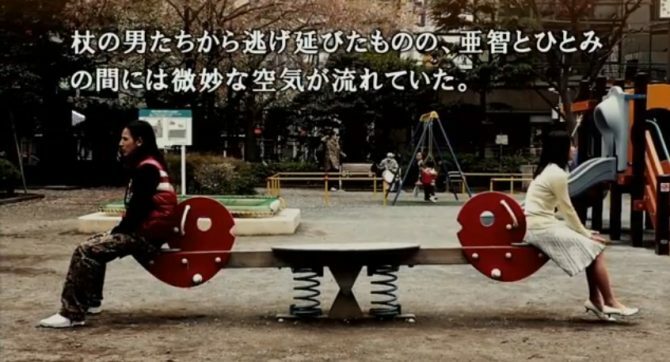 The game is shot with actual actors and actresses on the streets of Tokyo and comes off like a live-action TV show: shot frame-by-frame, and presented as still images. The game stars multiple protagonists living in a world together, with little knowledge that the others exist. The visual novel is not kinetic and requires the player to solve puzzles using clues given throughout the game’s story. 428: Shibuya Scramble first released on Wii in 2008, with ports to other consoles over the years that followed: additionally, an anime titled Canaan was spawned based of the game’s main scenario in 2009. 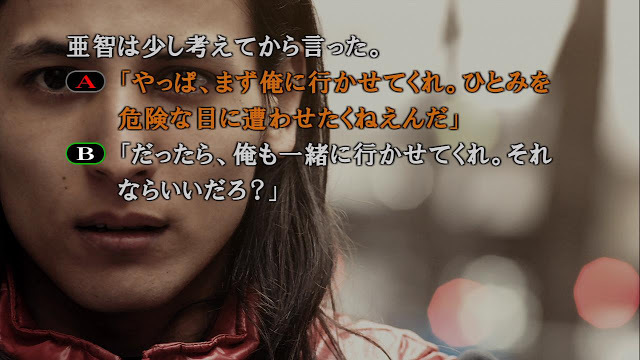 The game is shot with actual actors and actresses on the streets of Tokyo and comes off like a live-action TV show. 428: Shibuya Scramble is broken down into hour-long sections, beginning at 10am in the day. From then on, characters will be introduced to the story during the first hour of the game. After the 11pm hour, the game opens up and provides an accurate feel for what’s to come in terms of the scope and depth of the story. The game then will branch into different sections as the player makes choices, but it’s explained that there is a correct path to take. 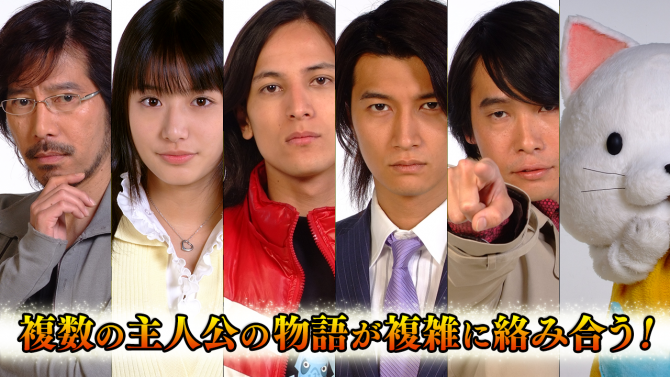 The game stars a total of five main protagonist characters: Achi Endo, Shinya Kanou, Kenji Osawa, Minoru Minorikawa, and Tama who all get wrapped up in a kidnapping case. The player must take on the role of each character over a 10 hour-long day. These stories run parallel to one another meaning players might replay sections of the story from a different perspective. As the player makes choices, the game’s story is altered, with a possible 50 different ways of ending the storyline. As the player makes choices, the game’s story is altered, with a possible 50 different ways of ending the storyline. One example of a branching path with a consequence would be where a character is given the option to run across the street in front of taxi, while ignoring a red light. After choosing to risk it and run across the street, the scenario will switch to the person in the taxi who is now late to an appointment because the taxi had to stop when a person ran in front of the car. However, this could have all been avoided had the player chosen not to run across the street. Thankfully, there will be an option to redo choices. However, the player might want to play through the game even if it’s leading to the bad ending. By doing so they will not only unlock additional content at the end of the game, but they’ll also get see some hilarious or horrible situations that the characters might find themselves in. The player might want to play through the game even if it’s leading to the bad ending. Instead of using an in-house localization team, Spike Chunsoft is working with Kajiya Productions to assist in the translation process. Lead by Alex Smith, the same team has worked on many beloved games, including: Tactics Ogre: Let Us Cling Together, Final Fantasy XII, and Vagrant Story, to name a few. 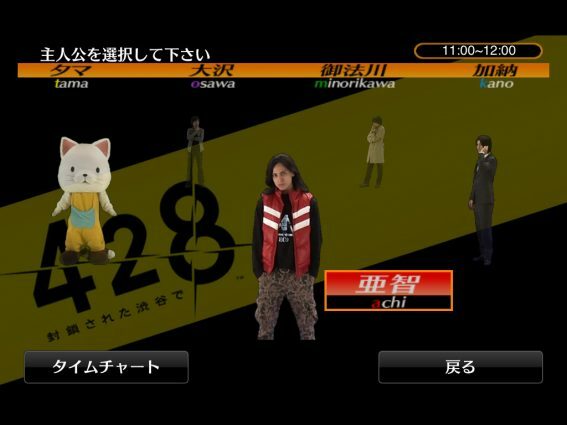 Spike Chunsoft chose this team because they had the experience to take the humor, drama, and wordplay of 428: Shibuya Scramble and localize it in a way that can be associated with by western gamers, but still retains the same feeling as the Japanese release. One of the games that Alex Smith worked on was the first Phoenix Wright game, which is pretty hyper about its humor and contains subtle jokes that can be difficult to work with, in terms of localization. Since there’s some of that type of humor in 428: Shibuya Scramble, Spike Chunsoft assures us that the localization team has done a good job with capturing that feeling. Every month, Kajiya Productions will send Spike Chunsoft pages of localized files that they as a company will go over and approve. Evidently, those who read the script will voluntarily laugh at the phrases that the localization team has come up with for some of the characters. Those who read the script will voluntarily laugh at the phrases that the localization team has come up with for some of the characters. 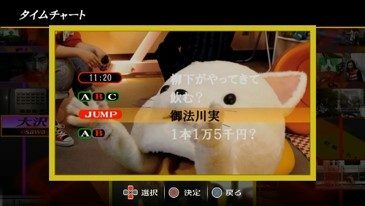 Spike Chunsoft’s David Kracker explained that the release of 428: Shibuya Scramble is a way for the company to gauge the interest of the visual novel market in the west by releasing of some of their more niche titles, outside of the Danganronpa and Zero Escape series. More specifically, the localization of 428: Shibuya Scramble could mean that more of the developer’s titles could see a release in the west, such as Machi and also a proper release of Banshee’s Last Cry (Kamaitachi no Yoru). The latter was released half-heartedly in the west on iOS a few years ago, although with a not-so-great localization. Additionally, Spike Chunsoft is also looking into a possible release of Kenka Bancho Otome, but it might be some time before that happens. 428: Shibuya Scramble is a proper adventure visual novel for the west. With visual novel’s popularity on the rise, Spike Chunsoft is introducing this extremely niche, but beloved, game for a much larger audience. It’s left to be seen whether 428: Shibuya Scramble resonates with western fans, but I for one am expecting a brand new experience from a developer that has yet to let me down in the visual novel department. 428: Shibuya Scramble is coming to PS4 and PC in Spring 2018. I’d like to thank Spike Chunsoft’s David Kracker for sitting down with me and letting me ask (probably) too many questions about 428: Shibuya Scramble during E3 2017.